I've started to prepare for Maddie's 4th birthday party. I have a few weeks yet but, I'm the first to admit that I would procrastinate right up to the day if I didn't get things roll'n. With school almost out I know this lady will not have near as much "me" time. Maddie is taking her first ballet class and absolutely loves it. I think the dressing up part has the edge to all of this. When I asked if she wanted a themed birthday party - "Ballerina" was blurted out. She also really likes bright colors so I thought I'd add more of a brighter ballerina color theme to the traditionl pink. So I added fuchsia, lime green and orange. Most ballerina themes that I've seen out there are the traditional pink color so I thought this little twist would be fun! 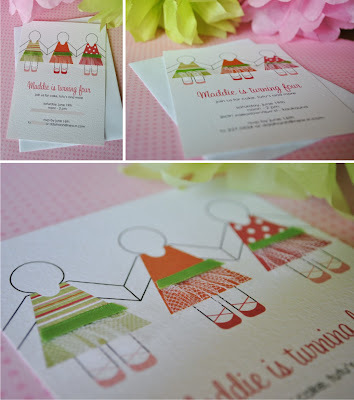 I've ran into these adorable table top paper dolls and it gave me an idea for her birthday invitation. I changed up the template a bit to make it my own by flaring out the dress a bit more, adding ballet shoes, clothing pattern and adding a fun little tutu(tulle). I really like the way they turned out and Maddie is excited to send them out to her friends. They were a bit time consuming but, thank goodness I only had to do a few. Stay tuned because I can't wait to share the rest of the party with you!